Features an elastic band with hook and loop rubber pull tab. Mesh fabric top for optimal comfort and flexibility. 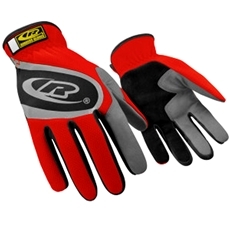 Premium synthetic leather, split palm for durability. Wrap around finger construction protects wear and tear zone. Reflective logo for increased visibility. Styles may vary slightly from picture.